I have a hard time thinking of what to write after this. It’s so deeply moving to think of how much He suffered for my sake, and for your sake, and for the entire world (John 1:29; 4:42; 6:33; 12:47). I find it interesting that John 3:16-17 doesn’t say that Christ died to save the church — it says He died for the entire world. The goal is to save as many people as possible (2 Pet. 3:9). In Matthew, Jesus further said, “Whoever receives one little child like this in My name receives Me. Whoever causes one of these little ones who believe in Me to sin, it would be better for him if a millstone were hung around his neck, and he were drowned in the depth of the sea” (Matt. 18:5-6) Since we are all God’s children, whatever age we are, I think it safe to extend what Christ says concerning His little ones to every new believer. James 2 talks about not showing partiality, or respecting people based on how much money they have. This principle can be extended to other factors as well. Take the example of “strangers” who joined Israel in the Old Testament. In our modern churches of God, a similar situation might be new people coming into the church without a Worldwide background and no clue who Mr. Armstrong was. Or maybe people in other groups that we not-so-secretly wonder if they are really part of the body. It is not our place to make judgements about who is and who is not part of Christ’s body and living in His sheepfold (John 10:16). If someone believes in Him, we should welcome them with open arms. If they keep His Sabbaths and enter into covenant with Him, like the strangers in Israel, we must not dismiss them. This statement should disabuse us of any notion that people of a certain social class or church background or ethnic group are in some way better or worse than others. The Pharisees had that idea — “We have Abraham as our father” — and John the Baptist told them they were a “brood of vipers” and “that God is able to raise up children to Abraham from these stones” on the ground near the river. Their background did not matter, only that they repent and “bear fruits worthy of repentance” (Matt. 3:7-9). How much less strife would there be within the church and in our interactions with those who do not yet believe if this were our attitude! 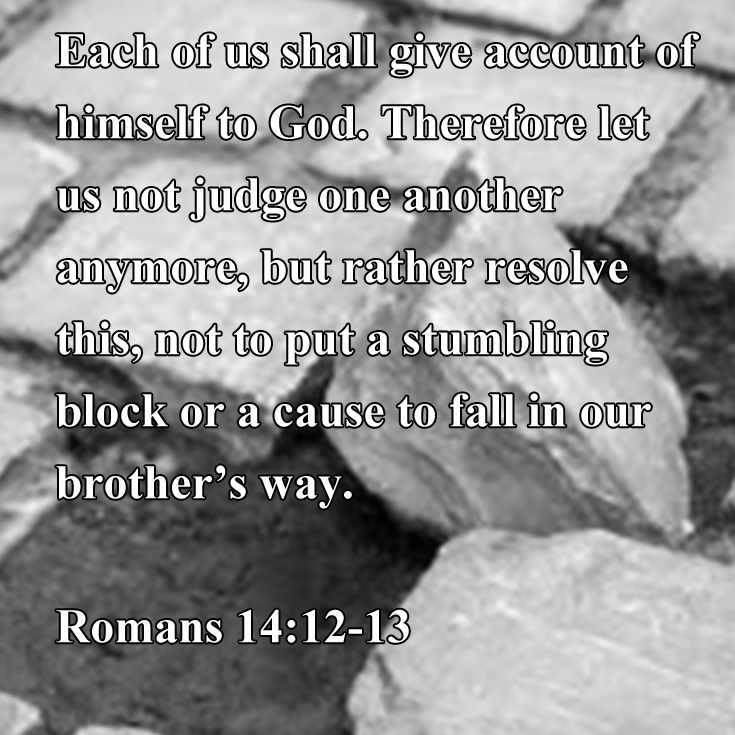 When we set aside our selfishness and look after other people before ourselves, we are following in Christ’s footsteps. When we are becoming like the “head over all things to the church,” we truly begin acting like the body of Christ (Eph. 1:22-23). We are supposed to imitate God and “walk in love, as Christ also has loved us and given Himself for us, an offering and a sacrifice to God for a sweet-smelling aroma” (Eph. 5:2). In the night He was betrayed, Jesus said, “This is My commandment, that you love one another as I have loved you” (John 15:12). Lest we think this statement is ambiguous, John spells it out clearly in his first epistle: “By this we know love, because He laid down His life for us. 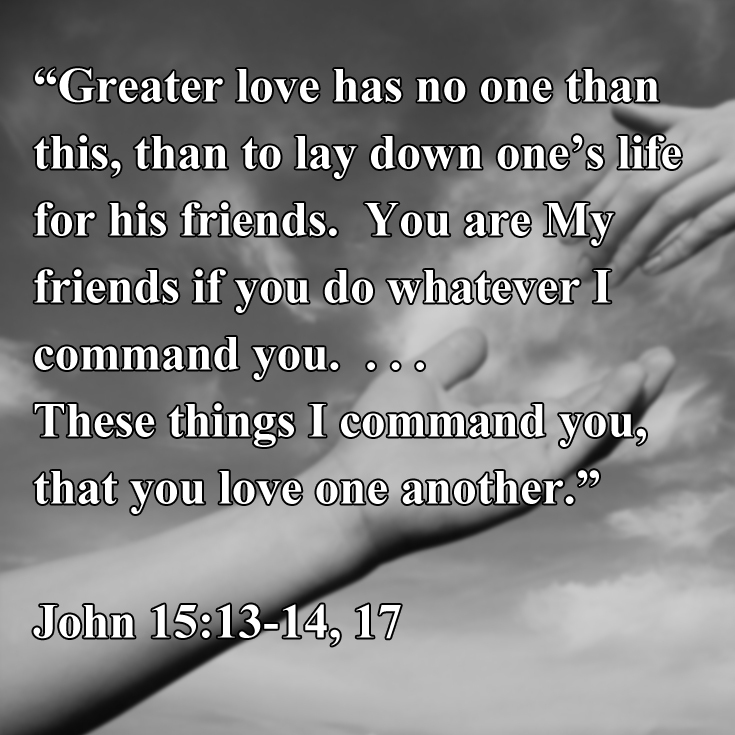 And we also ought to lay down our lives for the brethren” (1 John 3:16). Still, we might try to find some wiggle-room in this command. It only says to love the brethren — I don’t have to love all those other people, right? Wrong. Well there it is — not a smidgin of wiggle-room left. We have to love everyone the way God loves them and the way He loves us. Jesus paid the highest price ever paid so that the world could be saved. He is not going to look kindly on our actions if we try to pick and choose who is worth our love and who we should “let in” to His body. That’s not our call. 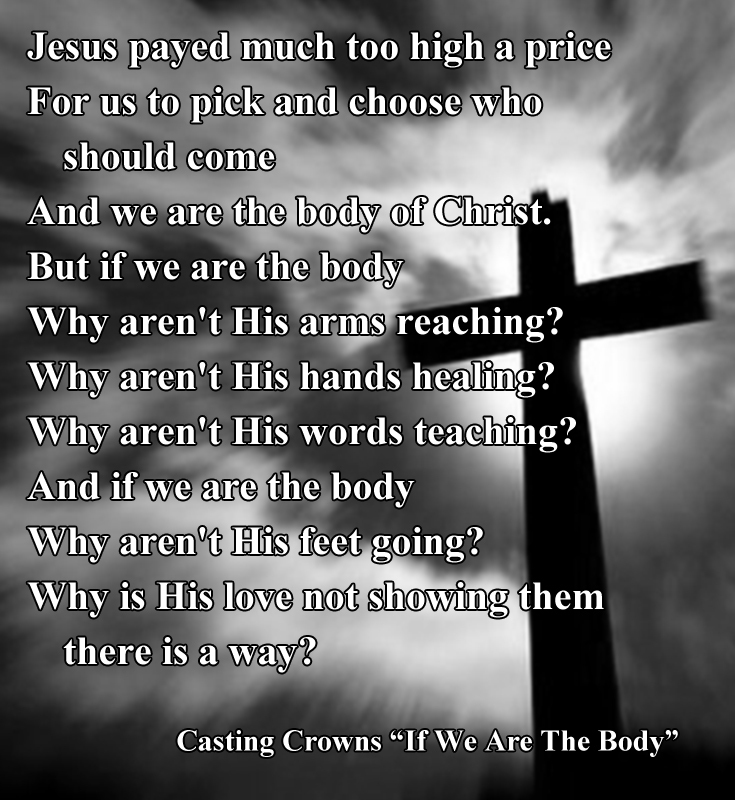 Today’s post is inspired by a Casting Crowns song called “If We Are The Body.” I’ll add a video of it at the end of this post, so you can listen to it if you’re not familiar with the song. It is basically a challenge to the Christian church — if we really are Christ’s body (and we know from verses like Colossians 1:18 that we are), why isn’t the church as a whole acting more like Jesus Christ? ♪ ♫ But if we are the body, Why aren’t His arms reaching? Do we have the same kind of compassion that Christ showed? He wept over Jerusalem because His people rejected His attempts “to gather your children together, as a hen gathers her chicks under her wings” (Matt. 23:37; Luke 19:41-42). He was constantly reaching out to help, encourage, and teach people. Each of us can bear witness to the compassion and mercy of God in our lives. Take just a moment to think about all the forgiveness He has shown you, all the times He picked you up out of hopelessness — and then look at the next chapter in Matthew. When Jesus sent out His twelve disciples, He instructed them to do the same thing He was doing: “preach, saying, ‘The kingdom of heaven is at hand.’ Heal the sick, cleanse the lepers, raise the dead, cast out demons. Freely you have received, freely give” (Matt. 10:7-8). It’s this last sentence that I want to focus on. Are we giving compassion, forgiveness, and help to others as freely as Christ gives those things to us? Or are we holding ourselves back from reaching out to certain people? ♪ ♫ Why aren’t His hands healing? We often seem to gloss over the phrase “gifts of healing” when reading about spiritual gifts in the church. We say that since we don’t see people today performing the same kinds of miracles that were happening in Acts 3:1-10 and 5:12-16, that these gifts are not present in today’s church. Paul did not, however, indicated that there will be a time when certain gifts simply are not around. I suspect that the gifts of healing can include a wide range of emotional, physical, mental, and spiritual healing. Some people have a gift for counseling others through emotional distress. Others with a gift for physical healing might practice a form of medicine. Those with a gift of faith can pray, trusting this promise:”the prayer of faith will save the sick, and the Lord will raise him up” (James 5:15). There is no reason to assume the lack of showy miracles means there are no gifts of healing in the church. 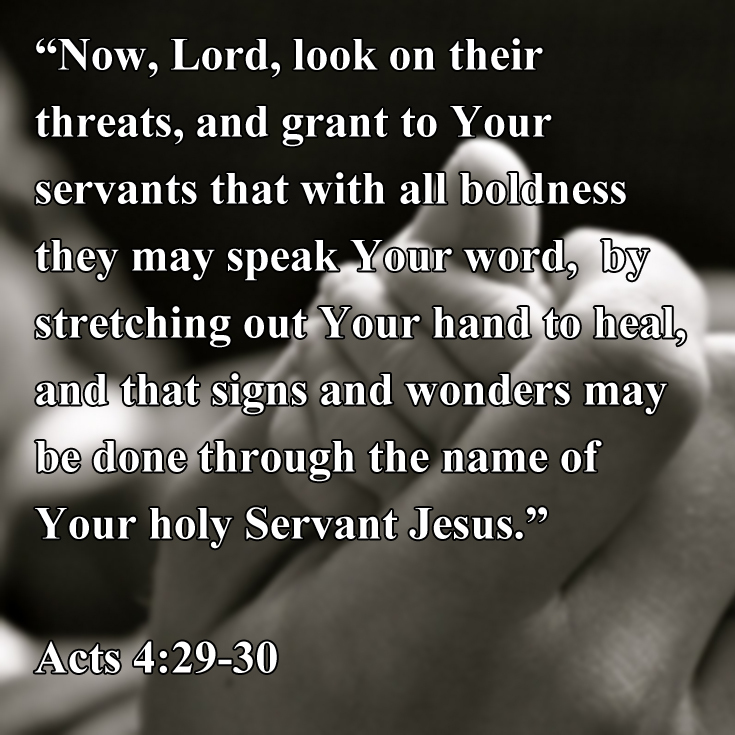 Not every person in the body of Christ will have a gift of healing (1 Cor. 12:28-30), but if those who have been given this gift are using it, then the overall body will have healing hands. ♪ ♫ Why aren’t His words teaching? The reason to want spiritual gifts is so that we might build-up, teach, and help each other within the church. Then, when conditions inside the church are as they should be, God will bring in new believers. How many of our church congregations would inspire this kind of reaction in someone who just walked through the door? TV shows, radio spots, websites, magazines, and booklets might help someone find a church group, but it’s the people who will inspire them to stay. If a new believer doesn’t see evidence that God is truly among us and hear His words being taught, they will keep looking for a church that actually acts like part of the body of Christ. ♪ ♫ And if we are the body, Why aren’t His feet going? When studying for this section, I was surprised to find how prominently feet figure in the Bible. The Lord “will not allow your foot to be moved” (Ps. 121.3), He delivers “my feet from falling” (Ps. 116:8), and His “word is a lamp unto my feet” (Ps. 119:105). The Israelites “feet did not swell” during all their years of wandering in the wilderness (Neh. 9:21). People sat at and anointed Jesus’ feet (Luke 7:38; 8:35; 10:39; John 12:3). Jesus washed the feet of His disciples (John 13:5-6). John the Baptist’s father prophesied that he would “guide our feet into the way of peace” (Luke 1:79). Where our feet are going indicates the direction of our lives. Are our feet headed toward evil, such as “feet swift to shed blood” (Rom. 3:15)? Or are our feet beautiful like “the feet of those who preach the gospel of peace,” and shod with that same gospel as part of our spiritual armor (Rom. 10:15; Eph. 6:15)? In Jeremiah, it says that “it is not in man who walks to direct his own steps” (Jer. 10:23). The only one who can direct our steps rightly is God, and He directs us to walk in the steps of Jesus. The context here is that to endure “grief, suffering wrongfully,” is commendable before God because it gives us the opportunity to mimic Christ’s actions (1 Pet. 2:18-20). As His body, we must be willing to walk in His footsteps, wherever that might lead. Love — agape (G26) — is the key to relationships. It is called “a more excellent way” compared to gifts of leadership, prophecy, healing, and working miracles. Even “the best gifts” are of no value if separated from love (1 Cor. 12:28-13:3). Jesus said that love among the breathren is how the entire world will recognize us as His disciples. This builds right upon the idea of someone being able to walk into a gathering of the church and see “that God is truly among you” (1 Cor. 14:25). As the discussion continues, Jesus also connects love to the idea following in His footsteps. Like in 1 Peter 2, following Christ includes the very real possibility of suffering. Here, with the focus on love, it also includes the idea of voluntary sacrifice for the good of another person. That is the kind of attitude that the entire church is to have. I am so blessed to regularly fellowship with a congregation like this. As we individually and collectively grow more and more like Jesus and learn to use our spiritual gifts “for the edifying of the body of Christ,” we will be better able to serve Him by serving other people (Eph. 4:12).